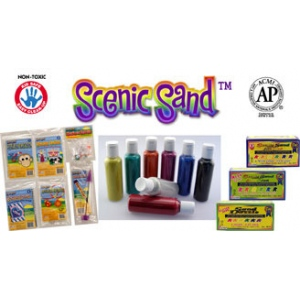 * Scenic Sand comes in a variety of assortment options. * Bottle assortments are complemented by peggable 1-oz and 4-oz. * Create colorful sand paintings, sand mosaics, sand projects for home decor and gifting. * Add that extra decorative dimension to paper mache, jewelry, baskets, wood cut-outs, boxes, and plaques. * A full range of beautiful colors gives you limitless design possibilities. * It's fascinating, fun, and EASY TO DO!